Your mother may have told you to eat your carrots to keep your eyes healthy and strong. This may actually not be that far from the truth - the vitamin A found in carrots is a crucial nutrient to optimize eye health. Your eyes need more than just carrots to stay healthy, though. There are several key nutrients involved in maintaining good eye function that can be easily obtained through a balanced diet. Research has shown that in addition to vitamin A, other carotenoids such as lutein and zeaxanthin, vitamin C, vitamin E, zinc, and some essential fatty acids are important components to preventing degenerative eye diseases. Knowing why certain nutrients are so important to eye health (along with the foods they contain) is key because there is absolutely no replacement for sense of sight and the quality of life good vision can bring (1). Vitamin A is a nutrient essential to optimize nighttime vision. Suffering from inadequate vitamin A stores in the body can cause night blindness, as vitamin A is a component of the cells that are responsible for seeing in dim and darker lighting. In addition, vitamin A has antioxidant qualities that fight against potential eye infections and helps to stall macular degeneration (the loss of eyesight that occurs naturally as we age). Vitamin A can be found in the orange-family of fruits and vegetables including butternut squash, sweet potatoes, red bell peppers, and carrots, but also in dark green leafy vegetables, eggs, liver, and milk (2-3). Lutein and Zeaxanthin are two types of carotenoids, which help to activate vitamin A in the body, and have several protective properties in regards to our eye health. Lutein and zeaxanthin comprise certain pigments within the retina and help to improve sharpness in vision. As antioxidants, lutein and zeaxanthin prevent oxidative damage and reduce the risk for both macular degeneration and cataract formation. Lutein and zeaxanthin can be obtained in the diet through carrots, orange and yellow peppers, salmon, eggs, cantaloupe, corn, and white pasta (1, 3, 4). Vitamins C and E are powerful antioxidants that can potentially reduce the amount of oxidative damage on our eyes. In spite of varied scientific results, several studies have shown that antioxidants like vitamin C and vitamin E may slow down the onset of age-related macular degeneration, prevent the formation of cataracts, and help to maintain acuity in eyesight. Citrus fruits (such as oranges, lemons, limes, and grapefruits), strawberries, bell peppers of all colors, and broccoli are just a few examples of foods that are rich in vitamin C. Nuts, sweet potatoes, and fortified cereals are great sources of vitamin E (1, 3, 5). Zinc is a type of mineral, as well as another great antioxidant, that serves our eye health in several positive ways. 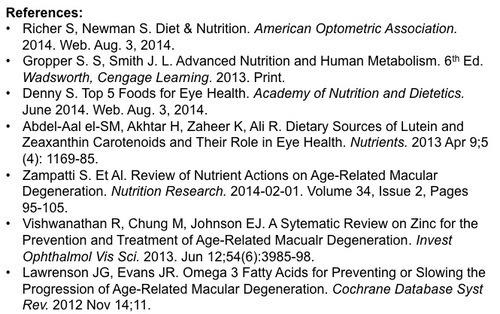 Zinc has shown to slow the progression of age-related macular degeneration and improve visual acuity. Studies looking at zinc saw the most benefits for eye health when consumed with foods containing vitamin A, C, and E. High protein foods like meat, poultry, and fish are the best sources of zinc in addition to nuts, whole grains, and legumes (1, 3, 5, 6). Essential Fatty Acids, especially Omega-3s, help eyes retain moisture and prevent dryness. Whether or not omega-3 fatty acids play a role in the prevention of macular disease or slowing degeneration of eye function is still debatable and warrants further research. While the scientific community continues to explore the relationship between essential fatty acids and eye health, we do know that omega 3s are beneficial for your health in other ways (e.g. heart health!) so don’t shy away from eating salmon, walnuts, olive oil, and flax seed - which are all wonderful and delicious ways to eat a dose of healthy fat (1,3,5,7). While research findings show these nutrients can or may optimize eye health, studies that look at supplementation of individual nutrients do not always show positive results. In fact, some studies that look at nutrient specific supplementation sometimes show negative health outcomes. It is more important to strive for a balanced diet that incorporates the color spectrum of fruits & vegetables as well as a variety of whole grains and protein in order to achieve the appropriate nutrients for not only eye health, but overall health in general. Vitamin A, lutein, zeaxanthin, vitamin C, vitamin E, zinc, and essential fatty acids such as Omega-3s show the most beneficial outcomes in eye health when present all together. At The Sage: Nutritious Solutions, we emphasize the "food first" ideology. Of course, always consult with your physician and dietitian before adding any supplement to your daily routine.